This attachment lets Mantis tillers be used to remove weeds, dead grass, moss and thatch from lawns. The sixty flexible spring steel picks gently pull up thatch and other debris across a 38cm/15 inch working width. 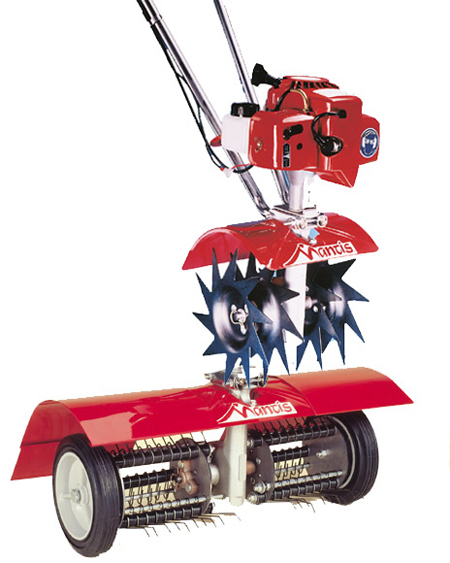 Save money by buying the Mantis Lawn Dethather and Lawn Aerator together, please note that tiller illustrated is not included. These items can be supplied carriage free to UK mainland addresses. Please note that the price for this item is for the attachments only.